Those critical of Narendra Modi for going too slow on reforms in his first 100 days as prime minister need not look any further than Russia of the early 1990s when a complete and hasty overhaul brought about a decade of chaos. It’s just been a little over a hundred days since Narendra Modi became the prime minister of the world’s largest (and messiest) democracy. There has been a lot of hope and expectations from every section of society and the impatient youth of the country who want to see India become a developed nation and an economic powerhouse. The prime minister has his work cut out for him, but it will take more than 100 days to reverse close to six decades of misrule. Most importantly, he has been working on making sure that the core issues of governance are fixed so that the government will be able to deliver better services to the citizens. Having a bureaucracy that is efficient is one of the keys to make India function better across the board. The emphasis on effective governance should never be underestimated. Several political pundits, many of those who have Western interests in mind, are calling for sweeping and immediate reforms in India. They praise the dismantling of the Planning Commission, which they say is a relic of Nehruvian Soviet-inspired Socialism. Fair enough. The pundits also want Modi to initiate sweeping and wide reforms without keeping in mind what happened when the Soviet Union collapsed. In a hasty bid to destroy every single working institution in the country, Messrs Gorbachev and Yeltsin wiped out people’s life savings, turned the country bankrupt and destroyed whatever remnants of stability existed in the country. All this was done at the bidding of Western experts and advisors. Russia and its citizens paid a heavy price over the next decade. A few families controlled almost the entire wealth of the country, while there was virtually no middle class. Government enterprises paid salaries in small arrears over a long period. The unstable environment also led to an unprecedented level of crime, backed by a shadow economy and the mafia. Essentially Yeltsin made decisions at the bidding of corrupt Western advisers, who were looking to make a quick fortune out of Russia. In ten years, more than $250 billion left the country in one of the largest flights of capital in history. None of this would have been possible without Western lawyers and accountants. When Modi decided to not toe the American line on WTO talks, he was looking after the interests of the Indian people. If he is indeed going slow on reforms, it’s simply because, as a practical person and is looking after India’s interests and not those of Western companies. No one wants an India where the multinational corporations dictate terms and policies to the government. The country needs changes and reforms but these have to be well thought of and executed. 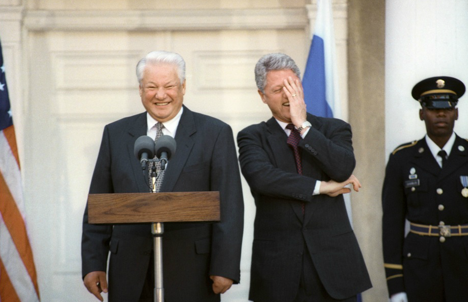 Tearing a house down like Yeltsin did would do nothing but bring untold misery for the country. It’s again important that the prime minister relies on the good counsel of the Ministry of External Affairs. In the last 100 days, it’s difficult to find fault with the way Modi has conducted Indian diplomacy. On the sidelines of the BRICS summit, Russia was assured of its important role as India’s partner. From this month onwards, the diplomatic engagement is being stepped up, culminating in Vladimir Putin’s visit to the country for the annual summit. India also seems to have established a restart on its relations with most of its neighbours, and put a large amount of focus on Asian integration, an area in the larger scheme of things where Russia will also come in given its fresh turn towards Eurasianism. When the USSR collapsed, Russia went 360 degrees on its foreign policy, dancing to Western tunes in hope of getting a place at the high table. At that time, when Russia was at its weakest, NATO broke all promises and continued expanding towards the gates of Moscow. The present tension in the heart of Europe can be attributed to this on-going American strategy of encircling Russia. If there is to be a paradigm shift in India’s foreign policy, relations with Russia will still have high priority, and it is unlikely that India will become an American lieutenant. Those who dream of greater Indian integration with the so-called West, should keep in mind that the Pentagon has no use for powerful countries. The American establishment, when it comes to foreign policy, looks for just one thing- to create vassal states, which let the greedy corporations in. Russia and China will be closely following the developments when Modi visits the U.S. this month. They can rest assured that India’s relations with America will be governed by the former’s interests. It’s indeed a wonderful feeling to have a strong leader at the helm in India, the kind of leader that puts his country first.